Aberdeen manager Derek McInnes thinks his whole team must shoulder responsibility for another two points dropped as they pursue leaders Celtic. 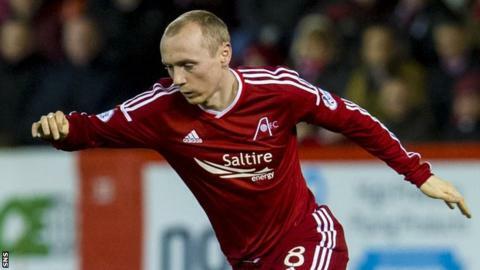 The second-top Dons drew 1-1 with St Johnstone in Perth, having been held 3-3 by Dundee at Pittodrie on Saturday. Willo Flood, just back from injury and in the side for the sidelined Ash Taylor, was taken off at half-time. "It was no reflection just on him," said McInnes. "It was a poor first-half performance from everybody." It was only the Irish midfielder's second game since November and his manager thinks it will take the 29-year-old time to get back to his best. "Willo's been a long time out and obviously we had to make a change, with Jonny Hayes moving to left back," McInnes told BBC Scotland. "It was a big ask for him, but his type of player, getting about players, he has to be up to speed and match fit and that was why it was important to get himself 45 minutes of football." The point lifts Aberdeen level with Celtic, but the reigning champions can move three points clear should they win the first of their two games in hand when they travel to face bottom side Ross County on Saturday. While admitting it was two points dropped, McInnes said: "I think the performance was not good enough to get all three. "I thought St Johnstone were the better team for the first half an hour. "They were far more aggressive than us and we were a wee bit out of sorts and never really got going. "In saying that, we still had chances in the first half, but I feel we were far better in the second half." Simon Lappin lashed in the opener for St Johnstone after half an hour, but Adam Rooney cracked in what McInnes described as "a terrific goal" from long range 12 minutes after the break. "Overall, we know it is a difficult place to come and a difficult place to come and win and the performance had to be better to win tonight," said McInnes. "As hard as the players worked, as committed as they were, I don't think the performance was quite at the level that we hoped for." St Johnstone manager Tommy Wright was pleased with the point considering he had to make six changes to his side as injuries continue to bedevil the Perth outfit. "It was an incredible game and I have said to the lads that we went punch for punch with one of the best teams in the country and we should be proud of our performance," he said. "And, particularly when they get the equaliser, we found a way to get back into the game and created as many chances as Aberdeen. "We feel like that is when we are at our best - when we play with intensity, when we press teams and we play high up the park. "When you consider that is the third game in six days, that's credit to the boys. "I'm really pleased with the fitness of the boys and the quality they showed in the game."